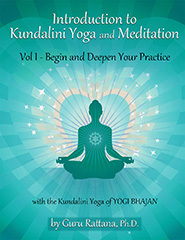 In her acclaimed book Introduction to Kundalini Yoga and Meditation Guru Rattana has succeeded in seamlessly combining the essence of Yogi Bhajan with her deep knowledge and unique insights, gained from 40 years of personal practice, study and teaching. In this book and its companion Volume 2 you will find everything you need to know in order to commence your voyage of self-discovery. Guru Rattana's wisdom illuminates your path, taking you deep within on a heart-centered journey of transformation and self-discovery, to a destination of self-love, inner peace and oneness with all.